For those who’ve known me for a really long time, or who’ve had my company filled with conversation about reminiscent life/alcohol or coffee-fuelled rants/wisdom of insight, you’d know that I’ve always wanted to pursue a life along the art path. Given, this was cast aside a few years ago because I lacked the motivation and drive to really, essentially, sell myself and sell my ‘product’, and it wasn’t enough to sustain the living expenses at the end of the day. Same story about every artist, doesn’t really matter what era or decade or century you live in, there’s not a lot of money in art, and if/when there is, there is some compromise you have to make. It’s a lot like life, really. So philosophical soapbox aside, I don’t regret going down the speech-language pathology path. Don’t get me wrong, I love this profession (someone give me a job already!) because I get to help people using several combinations of science, language, psychology and creativity, which is near equivalent to that of the artist, except the salary is better, albeit (currently) on temporary/contractual terms. But, I’ve digressed! I haven’t picked up a pen/pencil/brush to draw in the last two years. Well, haven’t drawn anything other than last-minute resources for my paediatric speech clients, that is. I found some old art journals earlier this week with some pencil and pastel drawings. I also found the last two drawings I made towards the end of 2011. 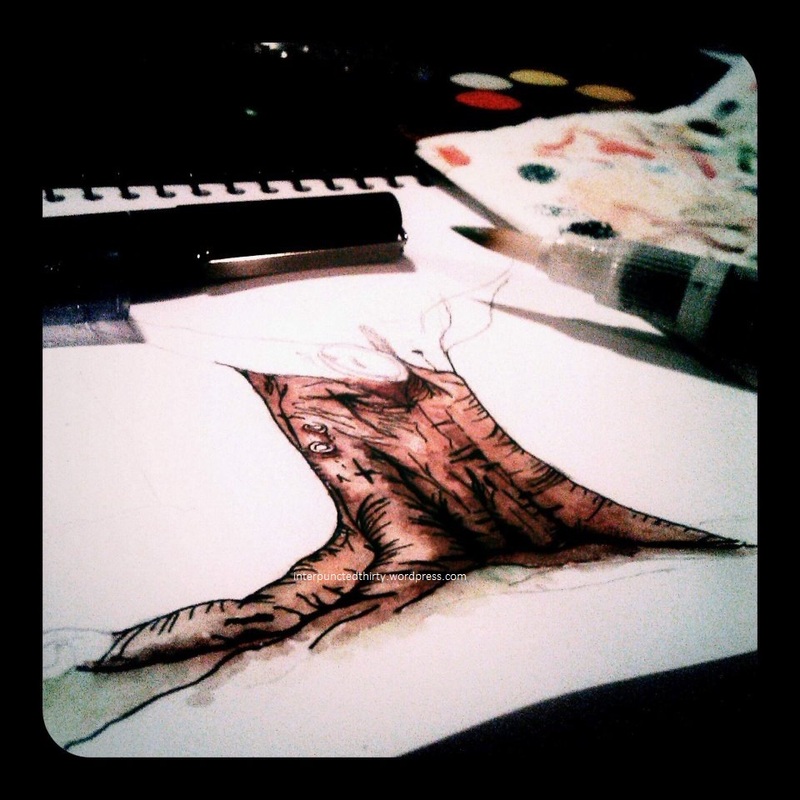 One is a rendering of a tree in Hyde Park using pen and watercolours. I could only find a picture, but can’t find the sketchbook with the finished drawing. The other one is a really quick doodle of a banana while I was listening to an audiobook of Richard Yates’ Revolutionary Road. It was the last banana in our fruit bowl, and at that stage, a very expensive one, because of all the floods in Brisbane and far-north Queensland wreaking havoc on our crops. Anyway, this was done with watercolours and fountain pen. I think I went through a watercolouring phase back then. Now that I have so much time waiting for jobs to be advertised, cold calling, etc., I’ve decided to pick up my trusty 4B pencil and start drawing again, if not to thwart the negative energy of the dismal speech pathology industry in Brisbane, but to relax my mind, and feed my fragile self-esteem. (I’m not always like this. I feel a bit defeated today with the lack of job prospects, after 3 weeks of job searching). I’m also going to try to tie this in with the InCoWriMo challenge starting in February, and the wonderful concept of More Love Letters. I currently have five recipients for the challenge and looking for another nine. Made me realise how many people I actually have email addresses for and not their physical home address. Oh technology, keeping us ever more connected but disconnected at the same time!